Camaro Power: Can GM’s New Models Woo Back Buyers? General Motors’ foreshortened bankruptcy, which was finished with the emergence last week of a “new” GM, owes a thank you to the Chrysler Group for blazing a short, quick path through the courts. Now GM’s recovery will rest on its ability to hold onto customers or win over new ones. That’s no small task as GM has been forced to skimp on cash for engineering during its year-long financial crisis. Even so, GM is off to a good start with its new Camaro, which shows signs of becoming a runaway hit. 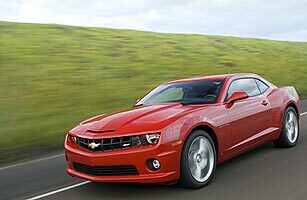 According to Ed Peper, the general manager of the Chevrolet Division, which accounts for 70% of the new GM’s total sales, Chevy dealers already have 25,000 orders for the Camaro, making it the hottest car GM has rolled out in years. With a muscular retro appearance, Camaro plays on the Baby Boom generation’s insatiable appetite for nostalgia. However, GM has betting on several other new models, which are planted in key market segments critical to GM’s future sales: the hybrid Chevrolet Silverado pickup truck, the Buick Lacrosse sedan and three new crossovers vehicles that are part car and part SUV, all of which will reach dealers soon. The hybrid Silverado, which gets better than 20 miles per gallon, is the first genuine hybrid in the critical pickup truck segment, which still represents 15% of the total U.S. market. It’s promising but a bit undernourished  the launch of this new hybrid truck has been undermined by cuts in production and advertising as GM has struggled to conserve cash. GM CEO Fritz Henderson says company-wide production should level out during the second half of 2009 and Peper asserts that advertising across models will increase over the next six months. If the hybrid Silverado is successful it could be a very tangible sign that GM is on the way to recovery since it would indicate that consumers have confidence in GM’s technology. The Buick Lacrosse, a traditional full-size passenger car in the near luxury segment, is GM’s answer to some very tough competition from Acura, Lexus and Lincoln. GM, which rode to glory on full-size cars but over the last two decades let its edge slip away, insists the new Lacrosse is quieter, handles better and is more powerful and more luxurious than the competition. Early reviews have been favorable. Can Wind Power Get Up to Speed?